Pakistan's health ministry announced on Tuesday that the agency will immediately establish polio immunizations posts at the country's international airports and other travel hubs. The government hopes this initiative will increase the number of people vaccinated for the disease and prevent its spread to other countries throughout the region and beyond. This initiative comes after the World Health Organization issued a statement warning about the growing number of incidences of polio, which they say is linked to Taliban insurgency in the region. WHO recommended that Pakistan, Syria and Cameroon, where polio is also a problem, require citizens to obtain a certificate proving they have been vaccinated for polio before traveling abroad. "Special measures will include establishing mandatory immunization counters on all airports, border crossings and seaports for all travelers," Sajid Ali Shah, a spokesman for the health ministry in Islamabad said during press conference. According to WHO, 60 percent of all polio cases in 2013 were the result of international travel. That year, there were 417 know cases of polio throughout the world, compared with 223 cases in 2012. The agency says at least 91 cases of polio were found in Pakistan last year, up from 58 in 2012. United Nations officials have warned of the growing intensity of the outbreak in Pakistan, which may spread to other countries in the region. Vaccination campaigns in Pakistan have been impeded by militants, who have targeted health care workers in a series of deadly attacks. "Becoming a polio worker in Pakistan has become a suicidal choice," a western diplomat in Islamabad told CBS News. The official asked in the interview to remain anonymous. 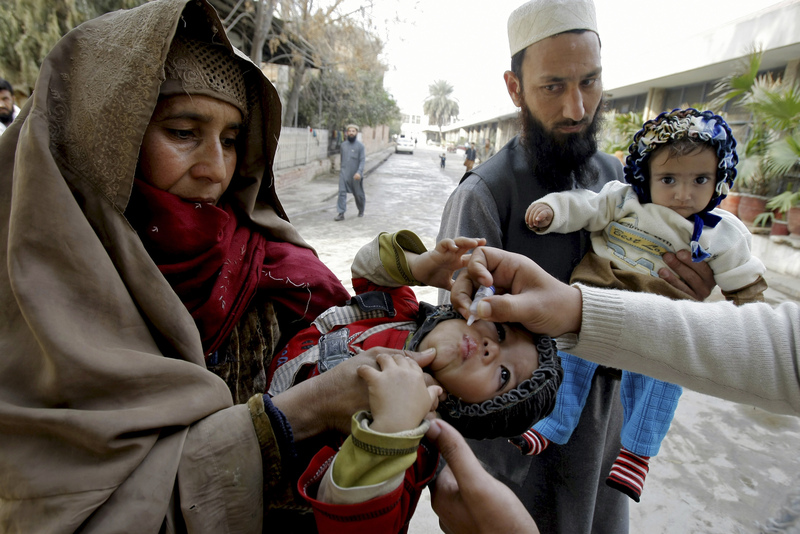 Over the last several years, Taliban-influenced Islamic clergymen have publicly opposed immunizing children on false grounds that the polio vaccine will cause impotence. Across a country with a population of about 200 million, more than one-third Pakistanis are believed to live in extreme poverty with virtually no access to health care, education and other basic needs. While Pakistan returned to democratic rule in 2008 following the departure of General Pervez Musharraf, the former military ruler, critics say elected politicians have not yet implemented basic social services for the country's citizens. "Pakistan's health care system has failed over time. There was a time when inoculation against diseases including polio was taken for granted. Clearly, that doesn't happen in Pakistan any more" Abid Hasan, a Pakistani national and former official of the World Bank who specializes on Pakistan's development-related challenges, told CBS News in an interview. "The outcome we have now seen with the WHO's warning tells you clearly that the quality of government has badly eroded over time." "For years, Pakistan has had the image of being a country where Islamic militants have challenged the authority of the government" said Farooq Hameed Khan, a retired brigadier and respected commentator on security affairs, told CBS News. "The new spotlight on Pakistan caused by the polio situation will further damage Pakistan's already weak credentials".